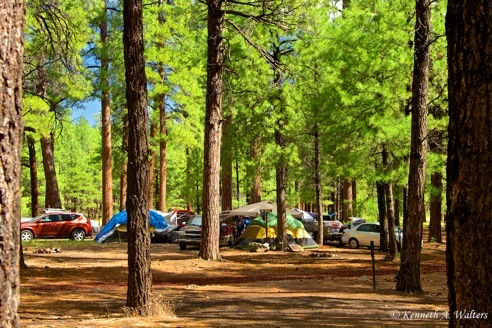 One of the best things about FFOTM are the campouts held under the stars and pines of nearby Flagstaff forests is the music. 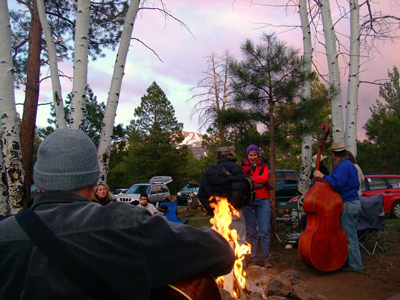 Campouts are a rare opportunity to unplug, share food, see old friends, meet new friends and mainly do a lot of pickin’. Celebrate Spring with some pickin’, grinnin’, potlucking and fun! Community Potluck: We will have a potluck dinner on Saturday night before sunset, bring something yummy to share. We will supply the main dish for grilling and a veggie option. We welcome your culinary creations! 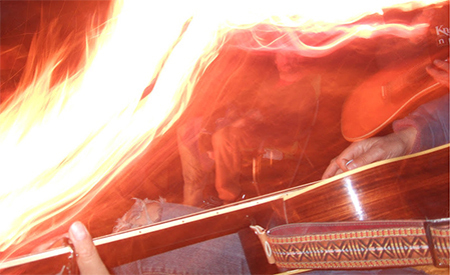 What To Bring: Bring your friends, warm clothes, firewood, potluck dish and your instruments for pickin’! Friendly pets are welcome on a leash. Directions: From Flagstaff, take I-17 south to the Willard Springs exit (Exit 236). From the exit, turn right onto the paved road. Follow the Forest Service road (NF 253) to the north around the backside of the compactor station. We will be camped on the right side (east) of the road within the next half mile or so – watch for signs along the road directing you to the site.